This story would conclude with how Spark Hire’s one-way video interviews erase the need for a phone screen. This allows recruiters and hiring managers to get to candidates’ most important answers and move to the next step. Recently, I came into contact with a Spark Hire customer who embodies this story to a T.
Enter: Open Listings. Open Listings is an all-in-one home buying service designed to give buyers an edge in any market. They give home buyers the ability to house hunt 24/7, create offers, and save thousands in fees — all from one’s computer or phone. To-date, they’ve helped buyers get over $500 million worth of homes and save $5 million. Their inspiration to look into Spark Hire was twofold: because a colleague had used another video interviewing platform and they wanted a better understanding of their candidates. For a candidate to be qualified, Open Listings requires them to be a licensed real estate agent. If candidates who qualify are warm, personable, and sell themselves well, they are likely to get hired. In the past, they sometimes used Google Hangouts and Zoom, but there was no video element built into their recruitment process. Spark Hire was not the only platform they looked into. On the demonstration, Spark Hire met their standards. Also, Open Listings liked our ability to customize interviews, integrate with their Applicant Tracking System (ATS), and pricing. Meeting their standards, plus these three factors, sold them on Spark Hire. The specific interview features Open Listings uses include take settings and advanced sharing. Take settings allow them to get longer answers from candidates and to limit their think time. These features give a more genuine reflection of candidates’ personalities. Advanced sharing does more than allow the team to view shortlisted candidates’ interviews. It also allows for the independent rating and comments of reviewers. Launching Spark Hire was easier for Open Listings because of their familiarity with their ATS, Workable. The Spark Hire and Workable integration allows mutual customers like Open Listings to create, review, and share Spark Hire interviews on a Video Interview stage of their hiring process in Workable. The support they received eased Open Listings’ transition to video interviewing. Soon after signing up, their Customer Success Hero walked them through the platform. Their Spark Hire training session was informative and helpful, as well as an entertaining break in the day. The Open Listings team took the day after training to work through the platform on their own. By the end of the day, the team felt confident to begin interviews almost immediately. Open Listings now receives applicants through Workable, then advances them to the Video Interview stage. They use the integration to send Spark Hire one-way video interview invitations to candidates. Open Listings’ one-way video interviews consist of at least three standard questions. They sent hundreds of one-way video interview invitations in their first few months on the platform. Open Listings has discovered a certain percent of their candidates will not complete a video interview. For them, an incomplete video interview is a red flag. The effort put into a video interview indicates a candidate’s interest level. The highlight of Open Listings’ implementation of Spark Hire is their hire rate from video interviews. They now achieve a 98 percent hire rate which is critical for the nature of the position and their rapid expansion. Not only is the completion of a Spark Hire one-way video interview telling, the team has found an increase in dedication and performance by their employees. Believe it or not, the Open Listings story gets even better. Behind their success with Spark Hire is a sole Spark Hire administrator. This is the person who can now automatically invite qualified candidates to video interviews. They can also review video interviews and share qualified candidates with the hiring managers. Open Listings no longer has to rely exclusively on interview notes. Hiring managers are able to analyze candidates directly from candidates’ interviews. This provides Open Listings with many independent opinions of candidates. Open Listings has also found their employee turnover has decreased with Spark Hire. They believe this is because their hiring is more accurate with video interviewing. For the few candidates who do not pan out, Open Listings retrospectively analyzes their interviews. This is an effort to isolate missed red flags. 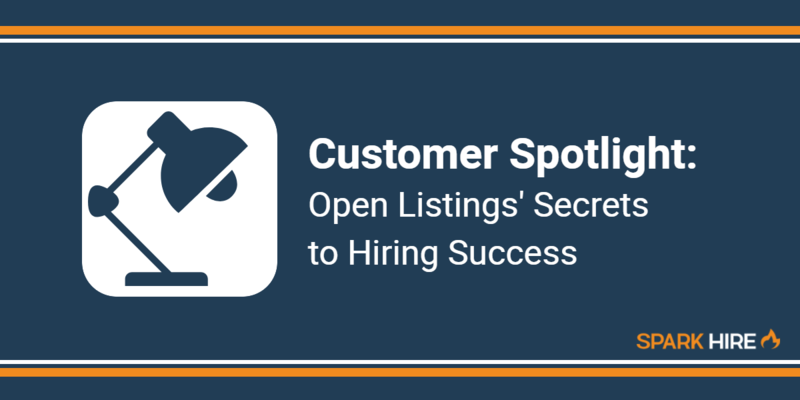 Open Listings uses rejection management and the interview recordings to learn from and improve their future hiring decisions. Open Listings is confident they will stick with Spark Hire and continue their initial success. They took the time to compare the platform to standard video options in the market before choosing a provider. Spark Hire will scale with them as they grow. All in all, Open Listings’ loves Spark Hire. Our platform has enabled both time and cost savings for the entire team. They have discovered a sure-fire method to streamline and automate their hiring process without losing its integrity. If you want to make better hires faster, request a demonstration of Spark Hire!